Some kids are voracious readers and every so often I get requests from kids who want "big, thick books"! These books are perfect for kids who devour books and like to delve into a chunky tome. The Name of This Book is Secret by Pseudonymous Bosch. Cass and Max-Ernest get caught up in an adventure when they discover the mysterious Symphony of Smells and decode a message from a magician in peril. Read my full review here. And consider adding the sequel: If You're Reading This, It's Too Late. The Castle Corona by Sharon Creech. Perfect for fans of fairy tales, The Castle Corona concerns the lives of many different people, none of who is happy with his lot in life. As the story unfolds, each character will figure out how to get what he or she wants... but often in unexpected ways. The Star of Kazan by Eva Ibbotson. Annika, a young orphan in Vienna, is delighted when her mother comes for her, but things don't turn out to be what they seemed. With a twisty, unpredictable plot and a stellar cast of characters, The Star of Kazan draws you in and doesn't let go until the story's done. Airborn by Kenneth Oppel. Cabin boy Matt Cruse feels more at home in the air than on land and aspires to captain his own airship one day. When he finds a mysterious man dying in a damaged hot air balloon, his life changes in ways he never could have predicted. Great for kids who love adventure and fantasy like Peter and the Starcatchers or The Golden Compass, this is one of my absolute favorites. Adam Canfield of the Slash by Michael Winerip. Adam Canfield, star reporter of his school newspaper The Slash, thinks he may have gotten himself in over his head this year by signing up to be a co-editor of the paper. Then along comes a story he can't ignore. A story that will require the entire newspaper staff to work together to pull off. And Adam knows that this is his chance to be a leader... or to fail as a leader. Can they get the scoop? And even if they get it, will they be allowed to print it? A great story for kids who like to write. Watership Down by Richard Adams. Get caught up in the inner world of this rabbit society in this classic book. When their home is destroyed, a group of rabbits must travel to find a new place to live, facing dangers along the way. Adams's rabbit society is complex with rules, folklore, and lan guage. This is certainly a book to get lost in. 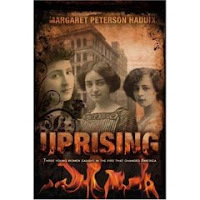 Uprising by Margaret Peterson Haddix (appropriate for middle school readers). The stories of three girls intertwine in this historical novel about the labor strike of 1909. Read my full review here. East by Edith Pattou (this would be appropriate for middle school readers, too). This lavish retelling of East of the Sun, West of the Moon is really well-written and a favorite among fantasy lovers at my library. Rose, the wayward daughter of a Norwegian family, is taken by a great white bear who promises her family riches in exchange for her living with him in his castle. A great fantasy adventure. A Tree Grows in Brooklyn by Betty Smith. This classic story of growing up in Brooklyn, New York really transports the reader to New York in the early 1900s. Francie is a really likeable character, a girl growing up and dealing with her unreliable dad, living in poverty, and figuring things out. It was one of my favorites in high school. I LOVELOVELOVED Castle Corona! Glad to see you recommend it here! I enjoyed Uprising a lot. I don't hear much talk about it. I'm glad you included it. I thought it was wonderful!